Your Home Heating bill is one of the biggest bills that you have to face each month. Heat Pumps are a cost-effective and environmentally friendly alternative to fossil fuels. It is the perfect way to heat your home or business. 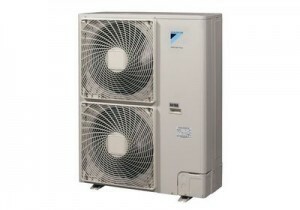 The Daikin Altherma Heat Pump System is a total domestic home heating and hot water system. It is based on air source heat pump technology. Heat pumps are a sustainable energy source by extracting heat from the outside air. The system can heat your home up to 5 times more efficiently than a traditional heating system that uses fossil fuels or electricity. It is environmentally friendly and can save you money on oil or gas costs. The system can also be used for commercial applications. How a Heat Pump works? A heat pump uses the same principle as a fridge but only in reverse. An air-to-water heat pump simply extracts the heat from the outside air and delivers it inside your home. 1. Air passes through the heat exchanger and the refrigerant absorbs heat from the outside air. 2. The vapour passes into the compressor and the compression increases the temperature. 3. The hot vapour is condensed in a second heat exchanger. 4. The liquid refrigerant passes back through the expansion valve ready to cycle again.